Star Wars returns to Marvel Comics in its original incarnation. Marvel’s first release will contain the first half of the original Star Wars Marvel comics line in a giant omnibus featuring most of the first half of the line. For those that bought the Dark Horse release of this, it won’t be the most exciting news. That said, for those that didn’t, this release looks very nice. I for one am excited for this release and I look forward to Marvel kicking of their new line by embracing their history with Star Wars. Another thing to remember is that not everyone is a hundred years old like the rest of us. With new droves of fans coming aboard in the near future as Star Wars kicks off again, this will be many young people’s first encounter with the original (and my favorite) Star Wars comic line. I also thought it was interesting to see the LEGENDS banner on comic books. That is very good to see and will ease confusion. You can read Johna’s original post on the announcement here. 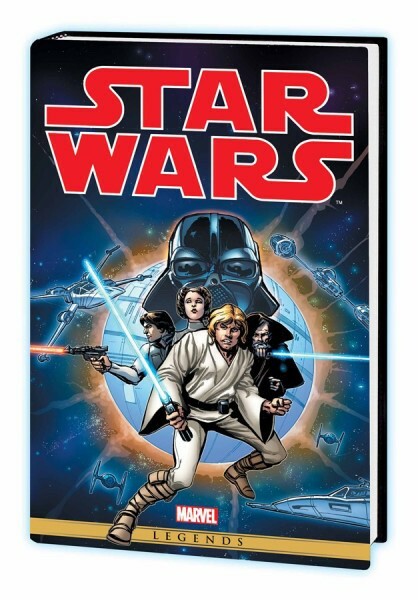 Star Wars: The Original Marvel Years comes out of lightspeed in January 2015 and is written by Roy Thomas, Howard Chaykin, Archie Goodwin, Jo Duffy, and Chris Claremont, with pencils by Howard Chaykin, Carmine Infantino, Walter Simonson, Herb Trimpe, Michael Golden, Al Williamson, and Mike Vosburg. Each copy of Star Wars: The Original Marvel Years will also be wrapped in a glorious covers by Howard Chaykin and Greg Hilderbrandt.